At the beginning of 2014, Bahrain’s economy continued to outpace average global growth and the government affirmed that an anticipated increase in in the non-oil sector’s contribution would strengthen its position as the gateway to the $1.5 trillion Gulf market. But the recovery momentum has since come under threat by a significant drop in oil prices as the kingdom continues to rely heavily on that resource. Still, indications are that Bahrain’s government is positive it will carry on with key projects in a bid to press for as much growth it can garner in the circumstances. Energy minister Abdul Hussain Bin Ali Mirza said the state would go ahead with implementing its oil and gas infrastructure development, including an import terminal for natural gas and expansion of a major pipeline and refinery. Bahrain plans to build a floating platform to import liquefied natural gas for industrial expansion. Projects worth a capital investment of $22 billion were lined up for the next four years including the development of Bahrain International Airport, Al Jazayer Beach, Durrat Al Bahrain investments, the Line 6 expansion and the modernisation of Bapco’s refinery. The $2 billion airport upgrade is important for Bahrain as it prepares to support greater industrial activity and greater visitor numbers. The proposed project will enable the airport to cater to 13.5 million passengers against 9 million now and an increase of cargo to 60,000, nearly double the present level. A project that businessmen are looking forward to is the second road link between Bahrain and Saudi Arabia – the King Hamad Causeway. Implementation of infrastructure projects is good news for vendors of commercial vehicles including excavators. Motor City, whose commercial vehicles include Isuzu, Hyundai and Hino, expects growth of 5 to 6 per cent in the sector in the New Year with projects in the pipeline and ones already awarded set to begin. The commercial segment had been down 3 per cent in 2014 although there was growth in the overall automobile market. Alba’s Line 6 expansion, part of the Bahrain government’s industrialisation vision, is awaiting formal approvals from various departments. It will add 400,000 tonnes annually to the present capacity of 933,000 tonnes. The downstream will welcome the project as Alba expects to deliver to it a majority of the additional metal. One of the major recipients of Alba supplies is Gulf Aluminium Rolling Mill (Garmco) which has its own plans to raise production capacity. Bahrain, the first Gulf state to install an aluminium smelter, has the largest downstream aluminium base in the region with potential for greater growth. “There is talent enough to develop the downstream locally. What is required is that the Government of Bahrain maintain the same level of support as in the past,” said Hamid Al Zayani, head of Midal Cables, which also receives Alba’s metal. In another metals field, there were positive developments. Bahrain Steel’s pelletising output in 2014 was up 40 per cent although overall plant utilisation remained low with raw material supplies from its two main Brazil sources hampered because of force majeure events. 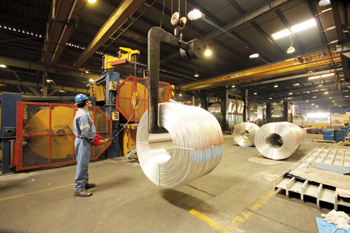 But with its suppliers having begun to boost deliveries, Bahrain Steel could be ramping up production by more than 80 per cent in 2015 and possibly reach its full capacity of 11 million tonnes in 2016. 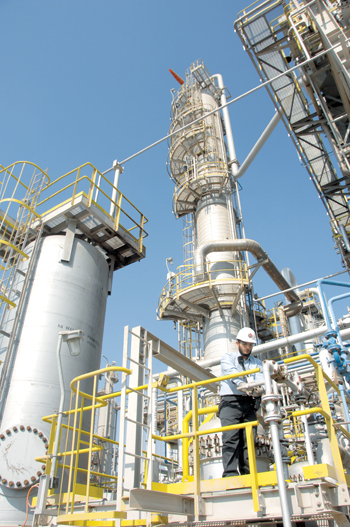 The company is looking at making the plant more energy efficient so it can utilise the available gas for a downstream merchant DRI plant within its fold. Such a plant could have annual production capacity of 400,000 tonnes. While the spectre of low oil prices hung over the horizon in the latter part of 2014, much had indeed been accomplished that year. Economic expert Dr Yousef Al Mishal termed it the year of economic recovery. Nasser Al Ahli, chairman of the Bahrain Society of Real Estate Agents, said 2014 marked the beginning of the gradual return of active property trade. Fitch Ratings acknowledges that growth accelerated in 2014 with both oil and non-oil activity looking up. It estimated that oil sector growth averaged 6 per cent in the first nine months of the year, while non-oil growth rose 5.2 per cent in the third quarter. Fitch has forecast overall GDP growth in 2014 and 2015 at 4.3 per cent. A factor in the kingdom’s economic growth in recent years has been strenuous government efforts to attract domestic and foreign investment into the manufacturing and logistic sectors. Industry and Commerce Minister Dr Hassan Fakhro said manufacturing surged 4.7 per cent in 2013 with total investment reaching around $1 billion while the Bahrain International Investment Park in Salman Industrial City attracted $2 billion within a few years of which 85 per cent was foreign direct investment. The minister told the Invest in Bahrain Forum recently that GDP expanded 80 per cent between 2000 and 2013 with employment growing 130 per cent, exports rising significantly and revenue from non-oil exports surging 229 per cent. Businessman Khalid Almoayed estimated that 45 per cent of Bahrain’s GDP could be attributed to the private sector in areas such as manufacturing, transport, trade, real estate, services and finance. The government’s proactive role was rewarded when several years ago snacks giant Mondelez opened a factory for making cheese and beverage powder. In 2014, Mondelez announced it was happy with both government support and its Bahrain business and would consequently set up a factory to make a range of its famous biscuit brands. The new plant it will establish comes at an investment of $90 million and will generate employment for several hundred Bahraini nationals while acting as a channel for business development among enterprises in the plant’s vicinity with regards to sourcing of raw material such as flour and sugar. A sugar mill set up in the last two years will be sourced for its requirements. Following on the heels of Mondelez’s decision for a second plant in Bahrain, a couple of entrepreneurs in Asia have announced interest in setting up their production facilities in the country. One of the interested parties is Gujarat (India)-based generic manufacturer Cadila Pharmaceuticals, which has approvals from the Gulf Central Committee for Drug registrations for many of its drugs. Another is Malaysia-based Pharmaniaga, a manufacturer of generic formulations and distributor of medical devices. A third plant will likely be set up by a Gulf company with Saudi financial backing. Entrepreneurial activity in the SMEs field is helping the industrialisation effort, Bahrain-based Majaal Warehouse Company, which now operates over $60 million dollars’ worth of flexible use industrial space, has completed its third phase and is eyeing similar ventures in Saudi Arabia and Oman.